People and the Environment | Giacomini S.p.A. Actions over words, this is what counts for us. Because of this we were the first local company to make this our philosophy, creating our corporate kindergarten. Per questo siamo orientati al miglioramento continuo, mantenendo le più importanti certificazioni integrate in tema di qualità, ambiente, salute e sicurezza sul lavoro. Come azienda ci sentiamo responsabili di tutto ciò che “tocchiamo”. Questa è la nostra filosofia quando guardiamo all’individuo e all’ambiente in cui operiamo. Human resources, and the professionalism and passion our employees show in their work, has always occupied a central space in our organisation. For this reason, since the sixties, we have been providing subsidised rent housing for our employees. And because of this, we wanted to celebrate the first fifty years of our business with an original and real gesture - the construction of a company nursery school for the children of our employees. 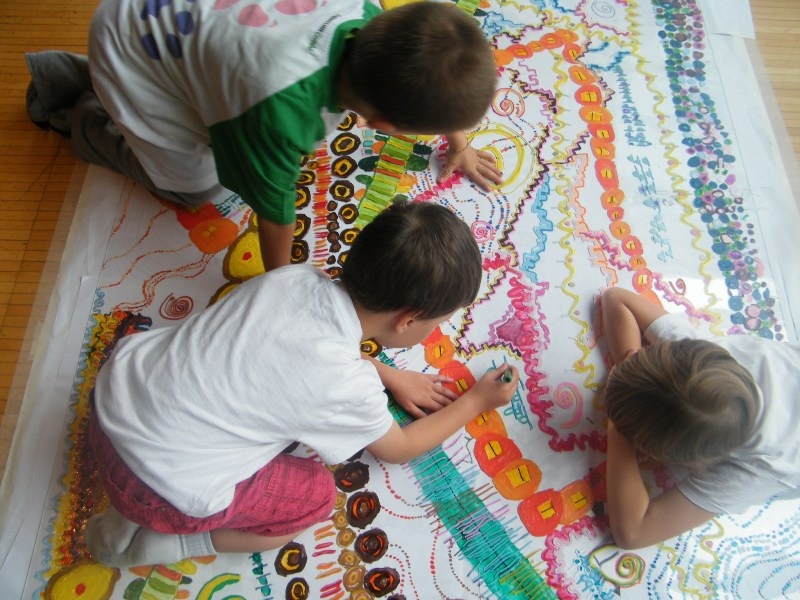 The structure consists of a range of spaces and forms designed with children in mind, through the application of a type of relational architecture. 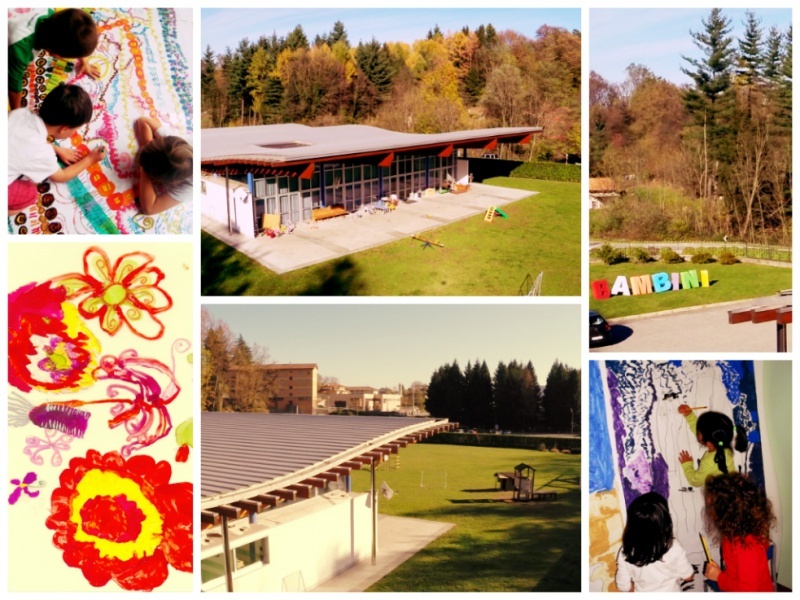 This approach prioritises spaces created for welcoming, well-being and life, with a view to generating a positive context which favourises the joy of learning, individual growth, cultural stimuli and social development. We regularly offer targeted training programs for employees, to allow them to acquire the expertise and specialist knowledge that make the difference to our business. Finally, we strive to demonstrate our care and attention with regard to our people by providing assistance to those who find themselves in situations of need. Since 2012, we have been sponsors of the non-profit organisation Food Bank Foundation (FBAO - Fondazione Banco Alimentare Onlus. For more information, visit www.bancoalimentare.it). We respect the environment through the concrete, tangible choices we make. 20,000 square meters of solar panelling on the roof of the factory help provide electricity to the headquarters at San Maurizio d'Opaglio. As of 2012, through the San Giulio Consortium in Novara, we only purchase green power which is not derived from fossil fuels. Geothermal and solar thermal power is used to air condition some of our manufacturing departments, serving as a valid example of buildings with low environmental impact. The ISO 14001 environmental certification, obtained by Giacomini in 2010, has driven us to reach major targets for reducing our consumption of raw materials such as water, gas and electricity. And we don't stop there: our goal for the coming years is to further reduce hazardous waste and water consumption. 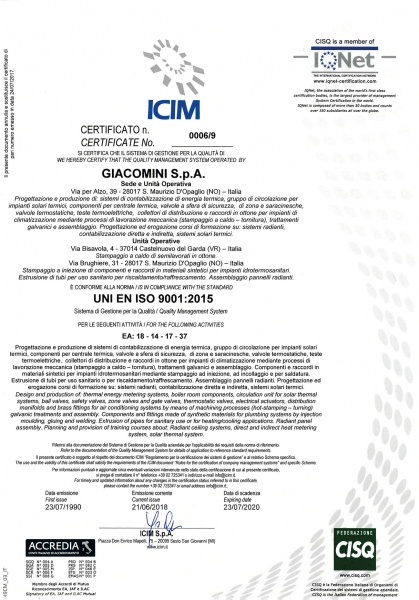 The company's quality management system has been established for decades and makes use of certifications for quality, health and safety and the environment, in accordance with standards UNI-EN ISO 9001, OHSAS 18001 and UNI-EN 14001. The environmental management and health and safety at work system has long been an integral part of the overall management of the company: we believe in prevention, and invest in such a way that increasingly restrictive laws cease to be constraints and are transformed into opportunities. It is for this precise reason that we have chosen to voluntarily adopt a health and safety at work environmental management system which complies with ISO 14001:2004 and OHSAS 18001:2007. This system incorporates health and safety policies and objectives with those relating to quality and, more generally, to design and production. to increase customer satisfaction and to improve our relationships with the public and with regulatory bodies, as a guarantee of our dedication to environmentally-friendly manufacture, reduced consumption and emissions and an improved working environment.